Carmelo Anthony is recognized while attending the Knicks game. What's next for Carmelo Anthony after he was reportedly dealt to the Bulls? The Starters discuss the latest reports that Melo has many suitors and he will be pick his team within weeks. Is it gonna happen? Will 2/4ths of The Banana Boat Boys finally come together? The Starters discuss. Ernie, Kenny, Chuck, and Shaq discuss why Carmelo Anthony wasn't able to fit in with the Rockets. As Carmelo Anthony parts ways with the Rockets, we look back at his time in Houston. Shaun Powell and Jared Greenberg to discuss what has gone wrong in Houston for Carmelo Anthony and the Rockets. Brain T. Smith of the Houston Chronicle joins Ten Before Tip to discuss the Carmelo Anthony situation with the Rockets. Mike D'Antoni and Daryl Morey addresses the media about the Carmelo Anthony rumors in Houston. Chris Paul addresses the media about the Carmelo Anthony rumors in Houston. The GameTime crew discuss Carmelo Anthony's future with the Rockets. Jared Greenberg and Kenny Smith talk about Carmelo Anthony adjusting to his bench role in Houston. James Harden makes a strong return from a three-game absence with 25 points and seven assists as the Rockets improve to 2-0 on their road trip with a 96-88 victory over the Bulls. Chris Paul notches a double-double with 32 points and 11 assists as the Rockets top the Nets, 119-111. Jusuf Nurkic and Damian Lillard both score 22 points apiece to lift the Trail Blazers over the Rockets, 104-85. Earned seventh career NBA All-Star berth with yet another season of headline performances befitting status as one of the game’s elite players...Finished second in the NBA in scoring (27.4) while leading the League in minutes (38.7)...Over 77 games (all starts), Carmelo averaged 27.4 ppg (second in NBA), career-high 8.1 rpg, 3.1 apg and shot .452 (743-1,643) over League-leading 38.7 mpg in his 11th NBA season...Went 167-415 (.402) from Downtown (career-highs 167 3PT FGM and .402 3PT pct. ; second straight 100+ home run year). Led Knicks in scoring in 66 of his 77 games...Led NYK in assists 12 times, rebounds 38 times...Scored double-figure points in each of his 77 regular season games...Had five 40+ scoring games (34 career) and one 50+ game (career-high 62 vs. Bobcats, Jan. 24), his fourth career 50+ game...Recorded 25 30+ scoring games, 22 double-doubles and one 20+ rebound game (20 reb vs. Clippers, Jan. 17, second career 20+ board game)...Scored 20+ points in a half 24 times. Led Knicks in scoring (outright or tied) in each of season’s first 27 games, prior to ankle injury. According to the Elias Sports Bureau, it was the longest such streak since Hall of Famer Nate Archibald led the Kansas City Kings in scoring in each of the first 44 games of the 1972-73 season...Went 459-541 FTA (career-high .848) and authored three streaks of 20+ FTM (Knicks season high 30 straight from Mar. 23-28; 27 straight from Jan. 14-17; 25 straight from Mar. 7- 19)...Scored 20+ points in 22 straight games, Feb. 12-Mar. 28...Only Knicks starter to score double-figure points on nine occasions...From Downtown, had eight four-homer games, three five-homer games, four six-homer games, and nailed seven 3PT FG on Feb. 24 vs. Mavs. Ended the season ranked 22nd on all-time Knicks career lists in total points (5,988), sixth in 3PT FGM (445) and second in scoring average (26.5 ppg, tied with Bernard King; minimum 100 games). Has averaged 20+ ppg in each of his 11 NBA seasons...Games played total (77) was third-best of career (tie)...Point total (2,112) was second-best of career (2,122 for Denver in 2005-06)...His 167 3PT FGM were a career-high...Notched career-high .848 from the line, his fifth straight .800+ FT season...Missed the Playoffs for the first time in his NBA career after advancing to the post-season in each of his first 10 seasons. Scored 18,000th career point in win at Atlanta, Nov. 13; 19,000th career point in win over Cavs, Jan. 30 and ended season just 42 points shy of 20,000 career...Notched 5,000th career rebound in 2OT loss at Orlando, Feb. 21...Had two four-point plays (Jan. 13 vs. Phoenix, Mar. 7 vs. Utah) and now has three career four-masters. Missed five games due to injury...Suffered sprained left ankle in win at Orlando, Dec 23, and missed next three games (Dec 25-28)...Did not dress for season’s final two games (Apr. 15-16) due to right labrum tear. Along with teammate Tyson Chandler, was named to the 28-man 2014-16 U.S. Men’s National Team, announced on Jan. 22...He and Chandler were teammates on the Gold medal-winning U.S. squad at the 2012 London Olympics...Member of Gold medal-winning U.S. Olympic teams at 2008 (Beijing) and 2012 (London), Bronze medal-winning team in 2004 (Athens). 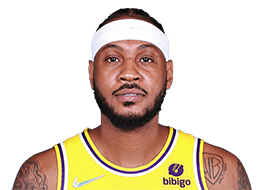 After winning the League’s scoring title in 2012-13, Carmelo finished second in 2013-14 with 27.4 ppg, trailing only Oklahoma City’s Kevin Durant (32.0)...Has ranked among NBA Top 20 in scoring in each of his 11 pro seasons, finishing in the Top 10 in each of the last nine campaigns...Led the NBA in minutes per game (38.7), joining Anthony Mason in 1995-96 (42.2) as the only Knicks ever to lead the League in that category...Ranked 30th in the League in rebounds (8.1), 17th in 3PT FG pct. (career-high .402) and 23rd in FT pct. (career-high .848). -- According to Elias, scored the most points in an NBA game (62) without a turnover since individual turnovers first compiled in 1977-78. Poured in 30 points (10-18 FGA) with five rebounds in 30 starting minutes for winning East squad at 2014 NBA All-Star Game at New Orleans, Feb. 16...Went 8-13 from Downtown, setting single-game All-Star record for 3PT FGM (8)...His 30 points tied the all-time high for a Knick in an All-Star Game, matching Walt Frazier (30 at Phoenix, 1975, Game MVP) and Bob McAdoo (30 at Milwaukee, 1977)...Made seventh career All-Star appearance, sixth career start (has been an All-Star starter in each of his three seasons as a Knick)...Garnered 935,702 votes in worldwide All-Star balloting presented by Sprint, third among East frontcourt players behind Miami’s LeBron James (1,416,419) and Indiana’s Paul George (1,211,318)...Had third-highest vote total among all East players and sixth-highest total among all players Leaguewide. Named KIA Eastern Conference Player of the Month for January (sixth career POTM award, third with Knicks)...Averaged 28.7 ppg (459) and 9.0 rpg (144) in leading Knicks to 10-6 month...Shot .452 (160-354) from the field and 44-89 (.494) from Downtown...Went 95-113 FTA (.841), including 27 straight FTM in mid-month...Month included three 30+ scoring games, five double-doubles and epic, record-breaking 62-point effort on Jan. 24 vs. Bobcats...Shared monthly honors with West winner Kevin Durant of Thunder. Named Eastern Conference Player of the Week twice (weeks ending Jan. 12 and Mar. 9)...For period ending Jan. 12, led Knicks to 3-0 week and averaged 27.0 ppg (81), 7.0 rpg (21) and 4.7 apg (14) with .478 shooting (33-69) and 9-18 (.500) from Downtown...For period ending Mar. 9, led Knicks to 3-1 week and averaged 29.0 ppg (116), 5.3 rpg (21) and 4.8 apg (19) with .500 shooting (45-90) and 14-31 (.452) from Downtown...They marked Carmelo’s 17th and 18th career POTW Awards (7th and 8th as a Knick). Oct. 31: Scored game-high 22 points with career-high six steals (Knicks season high) in one-point loss at Chicago, missing on potential game-winning three-pointer in final seconds. Nov. 14: Poured in game-high 45 points (17-30 FGA, 2-4 from Downtown, 9-11 FTA) with 10 rebounds in loss to Rockets (highest-point game for a Knick ever vs. Rockets). Dec. 11: Team-high points (30), rebounds (10) and assists (4) in win over Bulls...Went 7-8 FTA in game’s final 1:29 to ice the win after NYK had squandered a 23-point second half lead. Dec. 16: Scored game-high 32 points (12-20 FGA) with career-high tying four blocks in loss to Wizards, but missed on potential game-winning three-pointer at final buzzer. Dec. 18: Main cog in 2OT win over Bucks with 29 points, nine rebounds and four assists in career-high 55 minutes...Scored eight points in the second OT, including game-clinching three-point bomb with 50.1 seconds left to put NYK up 104-98. Jan. 17: Recorded Knicks’ first 20-20 game in nearly four years in loss to Clippers, with 26 points (4-23 FGA, 2-7 from Downtown, 16-16 FTA) and season-high 20 rebounds (seven offensive)...Highest rebound total as a Knick; two rebounds shy of career high; second career 20+ rebound game...NY’s first 20-20 game since David Lee (37 pts, 20 reb) at Golden State, Apr. 2, 2010...His 16-16 FTA fell three shy of Bill Cartwright’s 1981 club record for “best perfect” FT game (19-19 FTA vs. Kansas City; Nov. 17, 1981). Jan. 26: Followed up record-breaking 62-pointer vs. Charlotte with game-high 35 pts in ABC win over Lakers...Authored game’s biggest shots on back-to-back fourth-quarter possessions: 14-foot jumper with 3:11 left (103-98) and driving layup with 2:33 left (105-98) to seal Knicks’ win. Feb. 3: Game-high 36 points (13-25 FGA, 5-10 from Downtown) in loss at Milwaukee...Teamed with J.R. Smith (30) for Knicks’ only 30-30 duo of season...Scored 17 points in fourth quarter, but missed on potential game-tying three-pointer at final buzzer. Feb. 19: Poured in 42 points (16-29 FGA) to spearhead win at New Orleans...Scored 24 points in second half, including 13 straight Knicks points in fourth quarter to give NY the lead for good. Feb. 21: Recorded second straight 40+ game with game-high 44 points (16-28 FGA, 6-10 from Downtown), adding 11 rebounds in 50 minutes in 2OT loss at Orlando. Feb. 24: Notched 44 points (14-29 FGA, season-high 7-12 from Downtown, 9-9 FTA) with nine rebounds in loss to Mavs...Capped Knicks’ furious last-ditch rally with three-point bomb with :50.3 left to tie score at 108-108, only to see Knicks lose on Dirk Nowitzki’s buzzer-beating jumper. Mar. 7: Season-high eight assists with 29 points in win over Jazz. Mar. 31: Poured in game-high 34 points (11-19 FGA, 4-7 from Downtown) in win at Utah that capped 3-2 Western swing. 2012-13 (Knicks): NBA scoring champion...NBA All-Star...All-NBA Second Team...Authored a magnificent season in third campaign in NY...Led the NBA in scoring with 28.7 ppg, joining newly-minted Hall of Famer Bernard King (32.9 in 1984-85) as the only Knicks in franchise history to pace League in scoring...Added 6.9 rpg and 2.6 apg with .449 shooting (669-1,489) over 37.0 mpg (14th in NBA) over 67 games (all starts)...Went 157-414 (.379) from Downtown (first career 100-plus home run season); 425-512 FTA (.830) from the line...Recorded the third-best single-season scoring average in Knicks franchise history with 28.7, topped only by King’s League-leading 32.9 in 1984-85 and Hall of Famer Richie Guerin’s 29.5 in 1961-62...Season Highs: Points: 50* (Apr. 2 at Miami); Assists: 8 (Feb. 27 vs. Golden State); Rebounds: 19 (Apr. 11 at Chicago)...Led Knicks in scoring 54 times, rebounds 20 times, assists six times... Recorded 31 30-plus scoring games and eight 40-plus efforts...Double-figure points in 63 of his 67 games...Scored 20-plus points in a half 30 times, 20-plus points in a quarter twice...Had 10 points-reb double-doubles....Played in 700th career NBA game on Mar. 22 at Toronto...Scored 16,000th career point on Nov. 5 at Philadelphia, 17,000th career point on Feb. 2 vs. Sacramento...Honors: 2013 NBA All-Star...Named to 2012-13 All-NBA Second Team (sixth career All-NBA designation)...Named KIA NBA Eastern Conference Player of the Month for April (36.9 ppg with three 40-plus games, Knicks 8-2); fifth career POTM award (second straight in April, as he was also named East POTM for April 2012)...Eastern Conference Player of the Week four times (first Knick ever): periods ending Dec. 2, Jan. 6, Apr. 7 and Apr. 14...Finished third in balloting for 2012-13 KIA NBA Most Valuable Player with 475 points, behind Heat’s LeBron James (1,207) and Thunder’s Kevin Durant (765). Garnered the only first place vote that did not go to James (120)...Downtown: Went 157- 414 (.379) from three-point range, first career 100-plus home run season...On Jan. 27, 2013, tied Knicks single-game mark with career-high nine (of 12) three-point FGM en route to 42 points in win over Atlanta. Tied Knicks mark of nine 3PT FGM shared with Latrell Sprewell (twice), Toney Douglas and John Starks. Collected nine three-pointers through the first three quarters, then driving layup+FTM (Josh Smith foul) with just :12.5 left gave Knicks final 106-104 margin of victory...Life Begins At 40: Authored eight 40-plus scoring games, five shy of single-season club record of 13 by Bernard King in 1984-85...Scored 40-plus points in three straight games, Apr. 2-5, tying King’s franchise record set in 1984-85 (Nov. 21-24, 1984)...The three straight 40s: On Apr. 2, rang up a career-high-tying 50 points (18-26 FGA, 7-10 from Downtown) in win over Miami. Recorded Knicks’ highest scoring game since Jamal Crawford vs. Heat, Jan. 26 2007 (52), and 15th individual 50-plus effort in franchise history...On Apr. 3, scored game-high 40 points in win at Atlanta... On Apr. 5, tied King’s club record with third straight 40-plus game, pouring in game-high 41 in win over Bucks...30-Plus In Seven Straight: Had 30-plus points in seven straight games, Apr. 2-12, scoring 38.6 ppg during the streak and falling two shy of Amar’e Stoudemire’s club record of nine straight 30-plus games, Nov. 28-Dec. 15, 2010...20-plus In 31 Straight: Scored 20-plus points in a franchise record 31 straight games in a single season, Nov. 16-Feb. 1, averaging 30.0 points (930) during the run and smashing the prior team mark of 29 straight 20-plus games by Hall of Famer Richie Guerin in 1961-62...Time Away: Missed 12 games due to injury over the course of the season...Suffered lacerated left middle finger at Charlotte, Dec. 5, and missed next two games...Suffered sprained left ankle in win over Lakers, Dec. 13, and missed next two games...Suffered hyperextended left knee in Christmas Day loss at Lakers, and missed next two games...Suffered sore right knee in comeback win at Cleveland, Mar. 4, and missed next three games...Had a soft tissue fluid collection of his posterior right knee aspirated in New York, Mar. 14, and missed next three games...Suspended for one game by NBA for confronting Boston’s Kevin Garnett following Jan. 7 game at MSG (served suspension on Jan. 10 at Indiana)...Did not play (non-injury related) in regular season’s last two games...Additional Key Games: Logged season-high 50 minutes in OT loss at Brooklyn, Nov. 26 (35 points)...Game-high 45 points in comeback win at Brooklyn, Dec. 11...Ejected (two techs) in loss to Bulls, Dec. 21...After missing two games (knee), returned with a vengeance with game-high 45 points vs. Blazers, Jan. 1...Team-high 35 points with season-high eight assists to help offset Stephen Curry’s 54 points in win over Warriors, Feb. 27...Returned to Denver for first time since February 2011 megatrade, scoring nine points in 22 minutes in loss to Nuggets, Mar. 13. Left game in third quarter (right knee; missed next three games)...Scored 32 points in win over Bobcats, Mar. 29, combining with Smith (37) for Knicks’ first 30-30 scoring pair since Mar. 30, 2011 vs. New Jersey (Anthony 39, Billups 33)...Hauled in a season-high 19 rebounds (three shy of career high) with 36 points in OT loss at Chicago that snapped 13-game winning streak, Apr. 11. Playoffs: Averaged 28.8 points for the 2013 Playoffs, finishing second to Thunder’s Kevin Durant (30.8 ppg) on final 2013 NBA Playoff leader board...His 28.8 ppg (12 games) marked third-highest scoring average in Knicks team history for a Playoff season, topped only Bernard King’s 34.8 in 1984 (12 games) and Patrick Ewing’s 29.4 in 1990 (10 games)...Started all 12 NYK post-season games...Notched second-highest Playoff scoring average of career (30.7 for Denver in 2010)...Led Knicks in scoring in each of the 12 post-season games...Had five 30-plus scoring games and one double-double...Scored series-high 29.2 ppg in first round win over Boston...His 175 points were a Knicks Playoff record for a six-game series, breaking Patrick Ewing’s mark of 155 in 1993 East Finals vs. Chicago...Also established Knicks six-game series marks for FGM (61, later broken in Indiana series), FGA (160), FTM (44) and FTA (49)...Series high 36 points twice (Games One and Four)...En route to 36 points in Game Four (Apr. 28 at Boston), went 10-35 FGA and 16-20 FTA; 35 FGA tied Bernard King’s single-game club Playoff record (1984 vs. Detroit), and 20 FTA set a new club single-game Playoff mark (19 by Latrell Sprewell in 1999 vs. Atlanta)...Had 21 points in Game Six series finale at Boston (May 3), including game- and series-clinching three-point bomb with 1:43 left that put NY up by nine (84-75)...Series-high 28.5 ppg in East Semis vs. Pacers...His 65 FGM established a Knicks Playoff mark for a six-game series (had tied mark with 61 in the Boston series)...Scored Playoff high 39 points (15-29 FGA) in Game Six series finale. 2011-12 (Knicks): NBA All-Star...All-NBA Third Team...In first full Knicks season, averaged 22.6 points (sixth in NBA) and 6.3 rebounds over 55 games (all starts)...Led Knicks in scoring 31 times, rebounds eight times, assists 13 times...Had team-high 14 30-plus scoring games, two 40-plus efforts and eight double-doubles...Recorded his second career tripledouble (first with NYK) on Apr. 17 vs. Celtics (35 pts, 12 rebs, 10 ast)...Scored 20-plus points in a quarter twice and 20-plus points in a half 13 times...Scored 19 points with nine rebounds as starter for East at NBA All-Star 2012 at Orlando... Named KIA Eastern Conference Player of the Month for April (29.8 ppg with two 40-plus games; Knicks 9-4); first Knick to be named POTM since Patrick Ewing (January 1995)...Recorded two 40-plus scoring games, his first as a Knick: On Apr. 8, poured in a season-high 43 points in ABC Easter Sunday OT win over Bulls. Forced OT with three-point bomb with :11.2 left in fourth quarter (91-91), then capped memorable afternoon with game-winning three-ball with :08.2 left in OT (100-99), his 17th career game-winning shot in the final 10 seconds...On Apr. 15, scored game-high 42 points in ABC loss to Heat (only Knick starter in double-figure points)...Missed 10 games due to injury, all in season’s first half. Missed one game with sprained right ankle, two with sprained right ankle/sprained left wrist/sprained right thumb, and seven (Feb. 8-19) with strained right groin...Did not dress (CD) in season finale at Charlotte, Apr. 26...Spearheaded season-opening Christmas Day win over Celtics with game-high 37 points...Ejected (two techs) in loss to Bucks, Jan. 20 (35 points)...Held to just one point (0-7 FGA, 1-1 FTA), but added 11 rebounds in 33-point rout of Bobcats, Jan. 24...Game-highs 28 points and season-high 12 rebounds in win over Bucks, Mar. 26...Averaged team-high 27.8 points in the five first-round Playoff games (all starts) vs. Heat...Spearheaded Game Four win with game-high 41 points, recording 14th 40-plus scoring game in Knicks Playoff history. 2010-11 (Nuggets-Knicks): NBA All-Star...Led Knicks to NBA Playoff berth following acquisition in mid-season...Combined with Nuggets and Knicks, averaged 25.6 points (third in NBA) in 77 games (all starts)...Appeared in 50 games for Nuggets, 27 for Knicks...Had career-high .838 FT pct...Third in NBA in scoring (25.6), trailing only Oklahoma City’s Kevin Durant (27.7) and Miami’s LeBron James (26.7)...Recorded 24 30-plus scoring games (17 with Nuggets, seven with Knicks)... With Nuggets, added two 40-plus scoring games (including career-high-tying 50 points on Feb. 7 vs. Rockets)...With New York, averaged 26.3 points in 27 games (all starts)...Scored 30-plus points seven times with New York (Knicks high 39 points, twice)...According to the Elias Sports Bureau, became third player in NBA history to score at least 25 points in each of his first four games with a team, joining Wilt Chamberlain with 1959-60 Warriors (10 straight games) and Dominique Wilkins with 1993-94 Clippers (four)...Did not miss a game due to injury as a Knick (listed as Inactive in regular season finale, Apr. 13 at Boston)...On Feb. 20 - two days before trade to NY - played in NBA All-Star Game at Los Angeles (8 pts, 7 reb)...Named NBA Eastern Conference Player of the Week twice, in back-to-back weeks in April, becoming first Knick ever to win POTW honors in successive weeks...Prior to trade to NY, had 25.2 ppg in 50 games (all starts) for Nuggets... Scored a career-high-tying 50 points (16-24 FGA, 2-3 from Downtown, 16-18 FTA) vs. Rockets on Feb. 7...Hauled in career-high 22 rebounds at Phoenix, Nov. 15...Missed seven games in December; two due to patella tendinitis, right knee, five due to personal reasons...In his final game as a Nugget, scored game-high 38 points in win at Milwaukee, Feb. 16... Led all scorers with 26.0 ppg in first-round Playoff loss to Boston, tying all-time Knicks Playoff mark for FGA in a four-game series (88, also by Willis Reed vs. Baltimore in 1969)...Tied career Playoff high with 42 points, adding Playoff career-high 17 rebounds in Game Two loss (Apr. 19). 2009-10 (Nuggets): NBA All-Star...All-NBA Second Team...Third in NBA with 28.2 ppg in 69 games (all starts)...Had 31 30-plus scoring games, seven 40-plus games and one 50-plus game...Made third career NBA All-Star appearance (second start) on Feb. 14 in Dallas, scoring team-high 27 points for West...Western Conference Player of the Month for Oct./Nov. ; West Player of the Week twice...Scored 20-plus points in each of first 20 games, a club record...Scored a career-high 50 points (17-28 FGA, 1-4 from Downtown, 15-16 FTA) vs. Knicks, Nov. 27...Missed five straight games (Jan. 2-9) with right knee contusion; missed eight-straight games (Jan. 25-Feb. 6) with left ankle sprain...Had 30.7 ppg in six Playoff games. 2008-09 (Nuggets): All-NBA Third Team...Averaged 22.8 points (seventh in NBA) in 66 games (all starts) in injury-shortened season...Dished off a career-high 11 assists at Oklahoma City, Feb. 4...Scored 10,000th career point at Oklahoma City, Feb. 4; third-youngest player in NBA history to reach mark (LeBron James, Kobe Bryant)...Scored season-high 45 points vs. Wolves, Dec. 10. Scored 33 points in the third quarter to tie NBA mark (Spurs’ George Gervin had 33 in second quarter at New Orleans, Apr. 9, 1978)...Missed two games in October and one in March due to team suspension... Missed three games in December due to right elbow contusion, missed 10 games in January with non-displaced third metacarpal fracture, right hand...Scored 27.2 ppg in 16 post-season games as Nuggets drove to West Finals. 2007-08 (Nuggets): NBA All-Star...Fourth in NBA in scoring (25.7), adding career-high 7.4 rpg...Joined Alex English as only players in Nuggets NBA history to average at least 25.0 ppg for three-consecutive seasons...Started NBA All-Star Game at New Orleans (18 points)...Missed five games in Jan (left ankle sprain)...Averaged 22.5 in four Playoff games vs. Lakers. 2006-07 (Nuggets): NBA All-Star...All-NBA Third Team...Scored a career-high 28.9 ppg in 65 games (all starts)...Second in the NBA in scoring to Lakers’ Kobe Bryant (31.6)...Western Conference Player of the Month for April (28.5 ppg)... Scored 20 points in first NBA All-Star Game appearance, Feb. 18 at Las Vegas...Tied Alex English’s team record of six consecutive 30-plus games twice (Nov. 8-18 and Nov. 22-Dec. 2)...Recorded first career triple-double on Feb. 5, 2007 vs. Suns (31 pts, 10 reb, 10 ast)...Not with team Mar. 7 at Golden State due to birth of first child...Served 15-game NBA suspension (Dec. 18-Jan. 20) in wake of melee vs. Knicks at MSG, Dec. 16, 2006...Scored 26.8 ppg in five Playoff games vs. Spurs. 2005-06 (Nuggets): All-NBA Third Team...Eighth in NBA with 26.5 ppg...Western Conference Player of the Month for March...Made five game-winning shots in the last five seconds (Jan. 8 at Houston, Jan. 10 vs. Phoenix, Feb. 24 at Minnesota, Mar. 15 at Indiana, Apr. 6 vs. Lakers). 2004-05 (Nuggets): Finished 19th in NBA in scoring (20.8)...MVP of got milk? Rookie Challenge at All-Star Weekend (31 points)...Missed six early-season games due to sprained ankles. 2003-04 (Nuggets): All-Rookie First Team...Finished second in got milk? Rookie of the Year voting to Cavs’ LeBron James...Unanimous NBA All-Rookie First Team selection...Became first NBA rookie to lead a playoff team in scoring since Spurs’ David Robinson in 1989-90...Led NBA rookies and was 12th overall in scoring (21.0)...Set Nuggets rookie records for points (1,725), scoring average (21.0), FGM (624), FGA (1,465), FTM (408), FTA (525) and minutes played (2,995)...Named got milk? Western Conference Rookie of the Month six consecutive months (November thru April), also earned two NBA Player of the Week honors...Competed in got milk? Rookie Challenge at All-Star Weekend...Scored Nuggets rookie record 41 points vs. Seattle, Mar. 30, becoming second-youngest player (19 years, 305 days) to score 40 points in a game in NBA history. Three-time U.S. Olympian and two-time gold-medalist was key factor in gold-medal win at 2012 London Games...Member of gold medal-winning U.S. Olympic teams in 2008 and 2012; member of bronze medal-winning U.S. squad in 2004...Averaged 16.3 points (second on squad to Kevin Durant’s 19.5), 4.8 rebounds and .535 shooting (46-86) over 17.8 minutes in eight games (all off the bench) for gold medal-winning U.S. squad at ’12 London Games... Seventh on 2012 Olympic leader board in scoring (16.3), second in 3PT FGM (23-46, 500)...Scored 37 points (13-16 FGA) - a single-game U.S. Olympic record - in just 14 bench minutes in win over Nigeria, Aug. 2, 2012. Went 10-12 from Downtown and set another U.S. Olympic mark with 10 3PT FGM...Scored eight points (3-9 FGA) in gold medal win over Spain, Aug. 12... Joined Knicks teammate Tyson Chandler as 2012 Olympic gold medalists...Averaged 11.5 points for gold medal U.S. squad at 2008 Beijing Olympics...Averaged team-high 21.2 points as U.S. won gold medal at 2007 FIBA Americas tournament, with U.S. Olympic qualifying scoring records for scoring average and total points (191)...Team-high 19.9 ppg in 2006 FIBA World Championship of Basketball; named to All-Tournament Team...Named 2006 USA Basketball Male Athlete of the Year. In his only season at Syracuse, named Second Team All-America by The Associated Press as a freshman in 2002-03, leading Orangemen to 30-5 record and school’s first NCAA Championship...Named Most Outstanding Player of the 2003 Final Four and East Regional...Consensus national Freshman of the Year...Big East Conference Freshman of the Year and All-Big East First Team selection...Averaged 22.2 points (16th in nation) and 10.0 rebounds (19th)...In national championship game victory over Kansas, scored 20 points, adding 10 rebounds and seven assists...Scored season-high 33 points In Final Four win over Texas...His No. 15 college jersey was retired by Syracuse University on Feb. 23, 2013. Established the Carmelo Anthony Foundation (CAF) in 2005...Member of NBA FIT Team...In conjunction with the Carmelo Anthony Foundation, Feed the Children and Metro Ministries, delivered 500 boxes filled with food and cleaning supplies to a housing project in the Red Hook section of Brooklyn to families in need during the wake of Hurricane Sandy, Nov. 8, 2012...Joined Lakers superstar Kobe Bryant and a galaxy of Knicks legends past and present - Walt Frazier, Larry Johnson, Allan Houston, Earl Monroe, John Starks, Baron Davis, Tyson Chander, Raymond Felton, Jason Kidd and Amar’e Stoudemire - in attending landmark “12-12-12” concert presented by Chase for the benefit of the Robin Hood Relief Fund and victims of Hurricane Sandy, Dec. 12, 2012...Joined the rest of his teammates along with the Knicks coaching staff, alumni and a galaxy of A-list celebrities at the 14th annual Knicks Bowl presented by Unilever at Chelsea Piers, Feb. 11, 2013, the gala, star-studded event that has raised over $2.2 million for the Garden of Dreams Foundation...Joined teammates to host a clinic for 100 children to celebrate NBA FIT Live Healthy Week in conjunction with Garden of Dreams Foundation, Jan. 30, 2012 at MSG Training Center...Joined Knicks legends Walt Frazier, John Starks and Earl Monroe and teammates at Knicks’ Home for the Holidays Youth Clinic presented by Chase at Trinity High School in Manhattan on Dec. 20, 2011 through Garden of Dreams Foundation...Appeared with Amar’e Stoudemire on PBS “Sesame Street” episode in fall 2011...Attended gala celebration for Time’s 100 Most Influential People in April 2011...Dropped in at Garden to check out the progress of arena transformation, Jun. 30, 2011, chatting with construction workers and signing autographs...Released a children’s book in 2004 entitled “It’s Just the Beginning”. Carmelo’s No. 7 Knicks jersey was the League’s sixth-best selling jersey based on overall retail sales on NBAStore.com since the beginning of the 2013-14 season (announced Apr. 17, 2014)...Also had the fifth-best selling jersey based on overall sales from adidas and NBAStore.com from October 2013 through December 2013, reflecting record-breaking holiday season jersey sales...On Oct 3, 2013, it was announced that Carmelo’s No. 7 Knicks jersey was the sixth-best selling NBA jersey worldwide for the 2012-13 season...Wife La La co-starred in blockbuster film hit “Baggage Claim” released in fall 2013 and authored national bestseller “The Love Playbook” (Celebra Hardcover 2014)...Carmelo and La La celebrated publication of “The Love Playbook” with gala, star-studded celebration at Suite 36 in January 2014...Honored with his mother Mary at the gala Dress for Success “Something to Share” benefit at the event’s “Toast to our Mothers” dedication at the Grand Hyatt Hotel, Apr. 10, alongside Star Jones, Bethenny Frankel and QVC CEO Claire Watts...Joined Swizz Beatz, Rebecca Minkoff and DJ Fulano as honored guests at gala, star-studded Flipeez party at Bklyn Beast, November 2013...Honored guest at gala, star-studded opening of Frigo’s pop-up store in the Meatpacking District, Nov. 21...Served as co-host with Jeff Koons at the launch of Koons’ landmark Dom Perignon collaboration in September 2013...Joined Jamie Foxx, Billy Crystal, Jon Hamm, Edie Falco and Dr. Ruth at Cantor Fitzgerald’s and BGC Partner’s 9/11 Charity Day in September 2013...Joined teammate J.R. Smith along with Fabolous and Swizz Beatz at Catch after being honored at the 10th Annual Hennessy Privilege Awards in August 2013.